Factual error: Alexander's copy of Homer is a codex, or bound book, not invented for another 400 years or much used for 600 years. Continuity mistake: When Alexander pushes his wife onto the bed, she rips the Egyptian scarab ring off his finger and throws it across the room. And in the following shot, both of them still on the bed, is a close-up of her gently touching the same scarab ring - which is still on his finger. 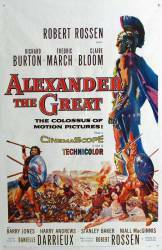 Alexander: It is men who endure toil and dare dangers that achieve glorious deeds. And it is a lovely thing to live with courage and to die leaving behind an everlasting renown. Danielle Darrieux plays Richard Burton's mother in this film. Darrieux (born 1917) was only eight years older than Burton (born 1925).